On Tuesday night, I was really craving Indian food. So, I headed over to Washington Square to check out a spot I have been interested in testing for a long time now - Tamarind Bay. 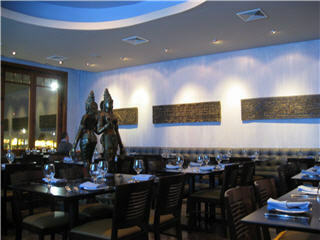 Tamarind Bay boasts of servicing coastal Indian food which heightened my interest that much more. Coastal Indian - I'm thinking tons of fish dishes and Goan-ish food. NOPE! It's typical Indian food that can be found in any Indian restaurant in Boston. Don't get me wrong, the food was FANTASTICHE but I was really hoping Tamarind Bay was going to offer something different. In any case, I devoured saag paneer, bhindi, and pulao. OMG just saying these things makes my mouth water. SO delicious and I love the seating arrangements. Though I didn't get my coastal Indian food, I do highly recommend Tamarind Bay. They are situated in a great, happening location and serve awesome food.